It’s a druggy and brooding account of a young man’s experiences abroad. Our narrator in Madrid is an insecure poetry scholar away from home with an at&t calling card and an unease about his conversational Spanish abilities. He’s also a pothead, as evidenced in his vivid and introspective descriptions of getting high in strange places and vice versa. A trick in parts of the storytelling is the narrator’s concern about language, which enables him to zig-zag and restate phrases as if trying to interpret the Spanish and present the possibilities of what he hears in English. So there is wiggle room in stating things with precision, a circumstance that suits our intelligent but often stoned-out and shy narrator. As the novel progresses we see he is much better at communicating than he himself believes. I’m prejudiced as far as finding keen interest this book. I was a student in Spain long ago myself. Doing drugs at that time (before the country was Westernized and still under Franco’s Guardia Civil grip) was not as prevalent and also very risky business. One of Lermer’s scenes presents a woman who makes gin and tonics “as a Spaniard would,” with a glass of ice filled with gin and a mere splash of mixer. That sounds more like the Spain I visited. His prose can also nail the elusive aspects and feelings of a relationship, especially when one party (our lead character and narrator) is less than truthful. In fact he makes up some whoppers: dead mom, fascist dad, he’s rich, etc. As the story gets deeper, he has to contend with his own lies. In a terrific stretch of writing he compensates by acting out another lie. Unable to afford it, he takes a girl to an exclusive restaurant and buys everything in sight, then beds with her in a pricey room at the Ritz Hotel. All of the damage is run up on his parents’ credit card. Meanwhile, terrorists have blown apart a train at the Atocha station, and as a result protests are occurring throughout Madrid. While his friends and love interest are participating activists, he is on the sidelines, a self-absorbed lump. He fails romantically with two extraordinarily patient and adorable Spanish women. You want to shake him. His poems are his only grace. 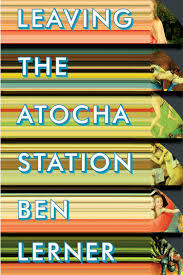 Posted in booknotes and tagged Ben Lerner "Atocha" review on December 16, 2014 by Wm P.